With only about ten thousand birds, Tule geese form one of the smallest populations of geese in North America. These birds winter at the Sacramento Valley in Northern California and nest in Alaska. 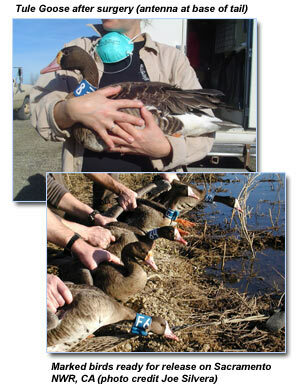 Tule geese look similar to the Pacific white-fronted goose, but Tule geese are larger and darker. Both are subspecies of the greater white-fronted goose. Mike Petrula of the Alaska Department of Fish and Game is one of Signals of Spring's collaborating partners. He loves studying these birds, and says that working with Tule Geese is, ". . . very addicting. [The birds] are hard to trap, clannish and secretive." He adds that the geese are, "neat birds because they tend to be very secretive; they tend to be in very remote spots. They hide in areas that people don't generally go to because they don't like disturbance." Mike and his colleagues at the California Dept. of Fish and Game are using satellite tags to find out where the birds go. But, Signals of Spring students often ask how the scientists tag the animals. Mike explains that catching Tule Geese is not an easy process! This season, it took his team a month to trap and tag 7 birds. To catch the birds, the team uses 'rocket nets.' These nets are 60 feet long by 30 feet wide, and are attached to metal pipes that act like rockets when detonated. The nets can be deployed using a remote charge up to ½ mile away, so that the birds are not scared off by nearby people. The team must patiently wait to capture a bird, because the nets make a loud BOOM when they are deployed! The net shoots out, covering birds below. The team can then attach the satellite transmitter, and the bird is let go unharmed. If a bird is not caught on the first try, it will likely not return to the same spot, scared away by the noise. The team must patiently wait to capture a bird, because the nets make a loud BOOM when they are deployed! The net shoots out, covering birds below. The team can then attach the satellite transmitter, and the bird is let go unharmed. If a bird is not caught on the first try, it will likely not return to the same spot, scared away by the noise. Once the birds are tagged and on their way, Signals of Spring students can watch their movements online. Before making their big trip up to Alaska, the birds spend some time in the Summer Lake Wildlife Area (Oregon) and Klamath National Wildlife Refuge in northern California. The geese normally spend about a month in these areas, probably eating as much as they can to build up their fat reserves before they travel north. When they arrive at their breeding grounds in Alaska, the ground is still frozen and food is scarce, so the birds must rely on the fat reserves that they accumulated before their long flight. Mike advises students to expect the Tule Geese to leave the Summer Lake area at the end of the April. He explains that researchers are not really sure what the cues are for the animals to begin their migrationonce they leave, they keep going regardless of the conditions up north. Maybe Signals of Spring students will learn more about these elusive animals.